Training started in late September and I gathered with fellow docents in the auditorium down the hall from the Museum’s Education Center which oversees the docent training and the educational program for the students who investigate and observe inside these concrete and glass walls. Caitlin Evans, the Learning and Initiatives Manager, greets us and gives us an overview of the training. The group of prospective men and women are not all regular docents. They are members of the community who often celebrate this holiday at home, speak Spanish or have some other connection to the Chicano/Latino world in Oakland. There are also younger members of the community—not the predominantly retired profile of docents who volunteer year round. There are, of course, some of us who come from the already-established ranks of the History, Art and Science Galleries. I am one of these. The lead educator is Rachel-Anne Palacios, a young latina who has been a part of the museum since 2004. 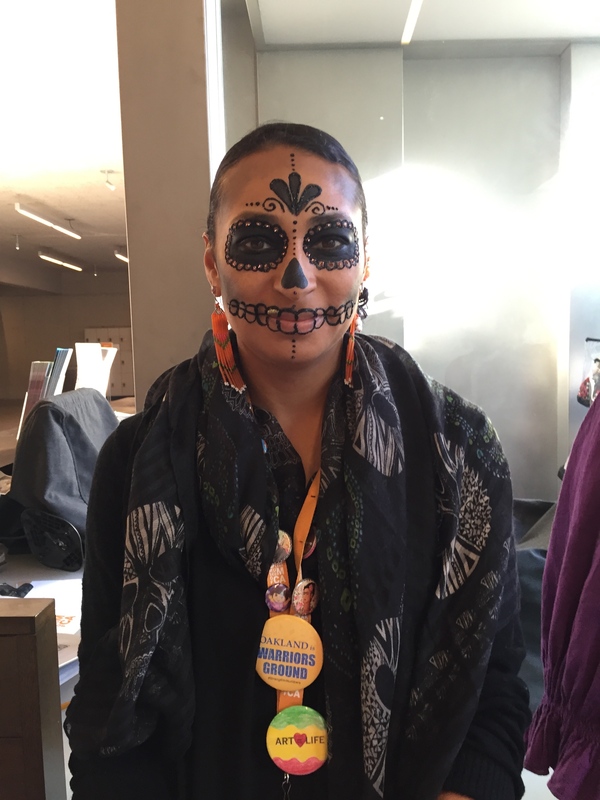 Rachel is an artist, and in 2004 and 2005 she was selected to be the lead artist in Dias de los Muertos at the Oakland Museum. Among other things, she creates nichos; I have several of her works in my home. 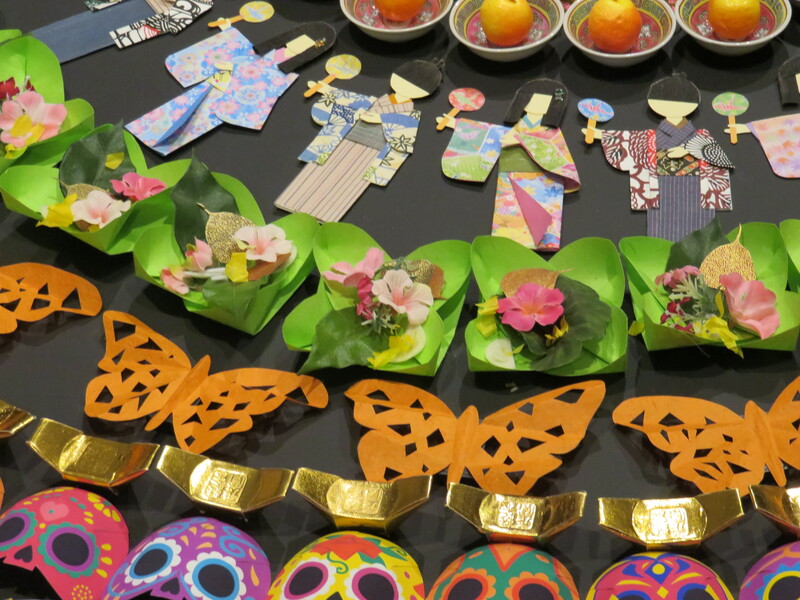 Nichos are shadow boxes, and hers are especially decorated for Dias de los Muertos. We also have another connection—we both love colorful shoes! After we met, we went around the room introducing ourselves, each using one word that represented our reason for coming today—my daughter, celebration, spirituality, cultural experience, my ancestors, children, transformation, change. Knowing at least one thing about all the participants, we were ready to get into the meat of our training. Rachel introduced a member of the latino community, Bea Carrillo Hocker, who helped the museum put together the first annual Community Celebration and Exhibit 21 years ago. She is our Guest Educator. Next year this museum exhibit will not take place, though it will return on odd-numbered years for some time, and the community celebration will continue each year. 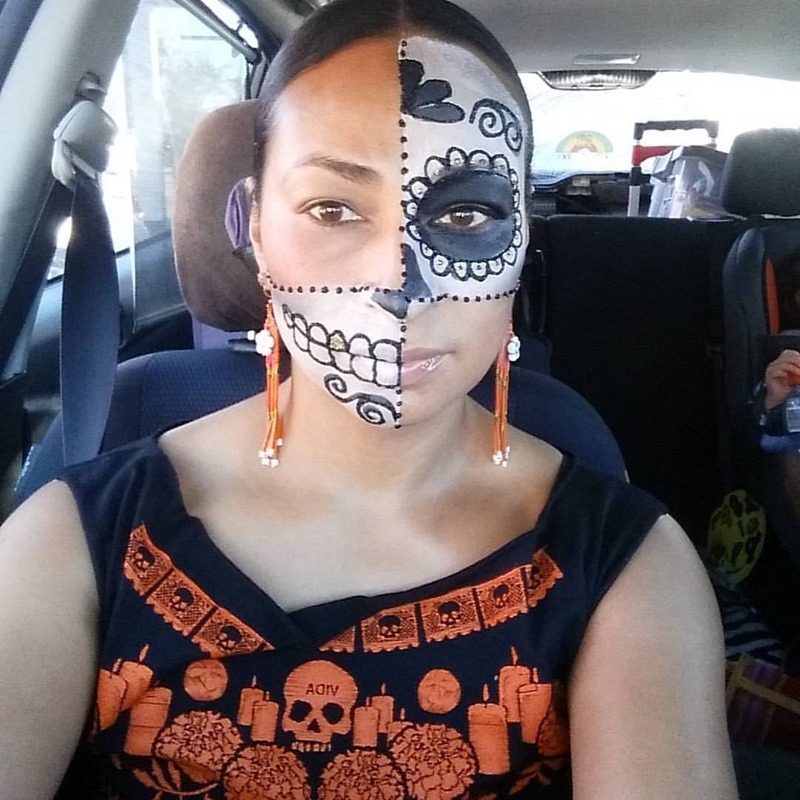 The pre-hispanic legacy’s similarities to the Dias de los Muertos celebration. That first day we went over a lot of early history about the Aztec celebration of death and how it changed when the Spaniards conquered the Aztecs in 1521. One of the differences between the Spanish and the Aztecs was that the Aztecs did not have any gods who were characterized as evil, the concept of evil being unfamiliar to the indigenous peoples. Prior to the Spaniards’ arrival, the Mesoamericans (Aztecs) held summer celebrations during which they primarily celebrated their dead. They would bring food and put small clay images on altars to honor dead warriors and ancestors. 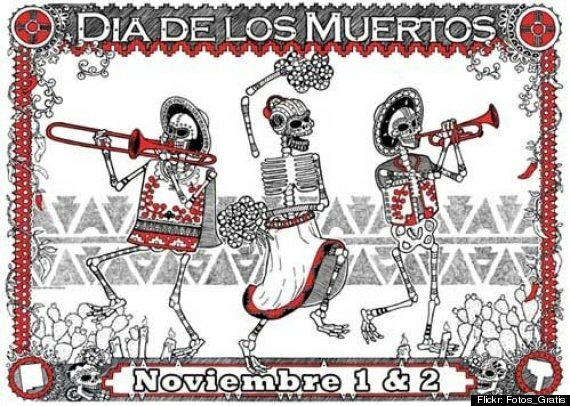 When the Spanish arrived, they wanted the Aztecs to adopt Christianity and celebrate All Souls’ and All Saints’ Day. When the Spaniards could see that the natives were not going to be able to leave behind their summer festival, the Spaniards moved the Aztec observance to November 1st and 2nd so that at least it closely aligned time-wise with the Christian celebration. But the celebration remained primarily a cultural event. The modern festival sometimes has Christian components, such as a cross on an ofrenda, but the traditional indigenous native American roots remain. All Souls’ Day was celebrated by the Spanish on November 2nd, to pray for souls in purgatory and is associated with All Saints’ Day (November 1st). Below is a one of the murals painted by Diego Rivera for the Palacio Nacional in Mexico City (1929–1945) depicting the exploitation of Mexico by Spanish conquistadors. As Diego Rivera’s mural shows, it was not an easy process. The natives are depicted as slaves carrying cargo on their backs and toiling as a group. There are dead natives hanging in the trees in the background. In the foreground, they are subservient and lying on the ground, overshadowed by the Spaniards. A native is plowing the earth and being whipped by a Spanish master. There is a Catholic priest praying over an Indian, presumably aiming for his conversion. The lack of respect for these people who have taken care of this part of the world for so long is shocking. 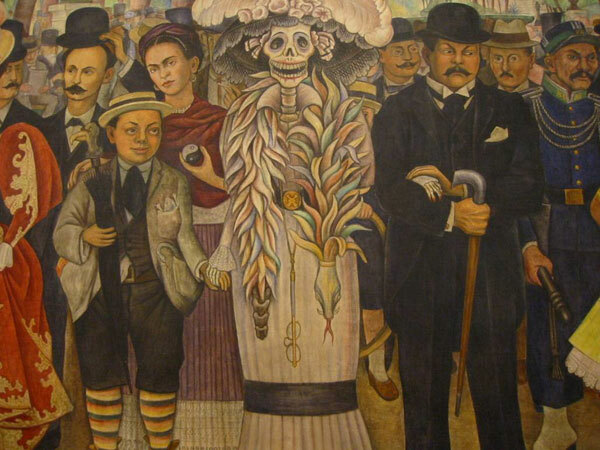 In a small portion of this mural, Dream of a Sunday Afternoon in Alameda Park, Rivera depicts himself as a chubby little boy, with mischief in his expression, holding the hand of a skeleton from Dias de los Muertos. It is a special skeleton though—Catrina. She is resting her other hand on the arm of her creator, José Guadalupe Posada, a political satirist and illustrator Rivera had great respect for. The skeleton Catrina is one of Posada’s most famous characters. Her feather boa is actually a boa snake. Through Catrina, Posada is making fun of upper class women. Rivera has illustrated the history of this painful time in many of his murals. His work continued to reflect the struggles between the classes in Mexico and in the United States until his death in 1957 at age 70. In the complete scene of this mural, Rivera painted the portraits of 150 known people. 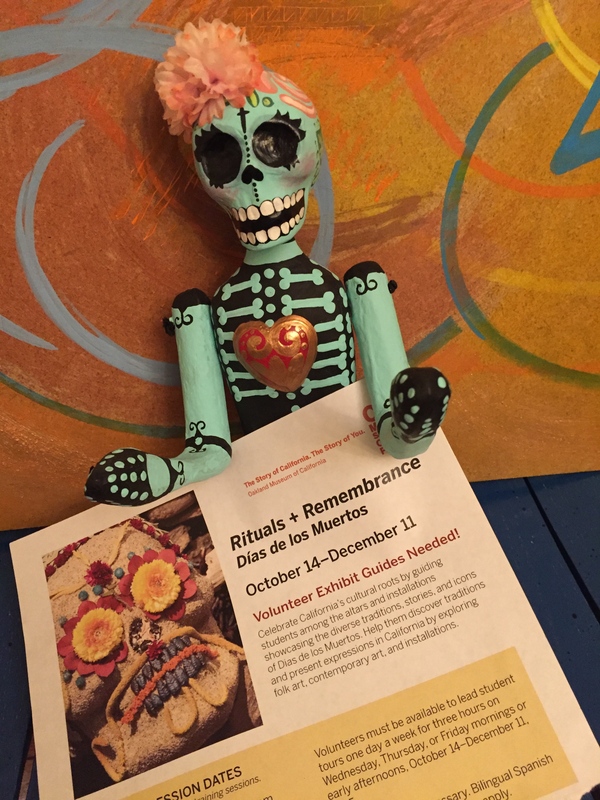 After a break in the basic history, we return to talk about the items on a traditional ofrenda—often translated as “altar.” As docents, we are encouraged to use ofrenda rather than “altar” so that it is not confused with a religious altar. This is a cultural observance, as opposed to a Christian religious holiday such as All Soul’s Day or All Saints’ Day. Not all these items are found on every altar. As we will see once we look at the exhibit, other items may represent the traditional elements. Our next gathering the following week was in a circle on the Oak Street plaza up the stairs from the 10th Street entrance. 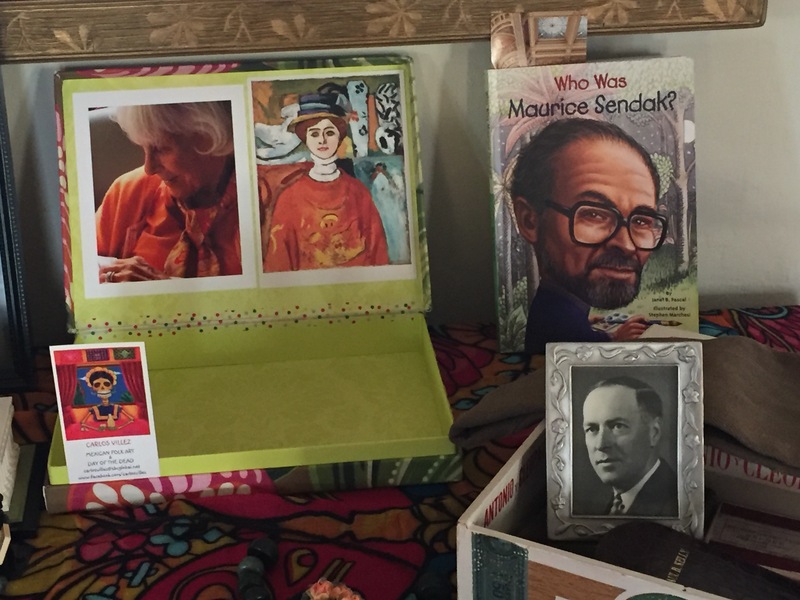 Some of us had received homework from Rachel the week before: to bring something to share that we might put or have put on an ofrenda. There were touching stories of a grandfather’s handkerchief, a mother’s photo, a flower representing a relative who had been a florist… After a break, we meet back in the exhibit hall with the partially installed ofrendas, gathering around the one ofrenda that has become my favorite for all age groups. 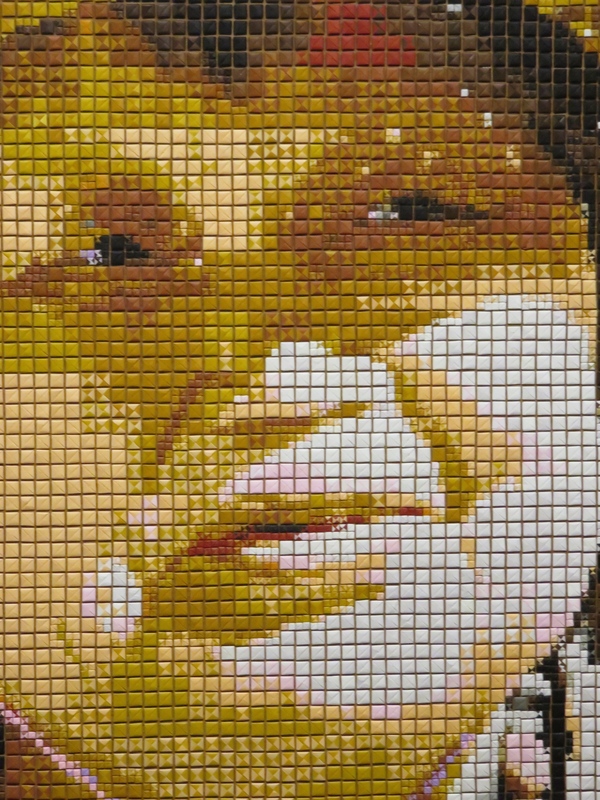 I have been working in mosaic with my friend Toni. We have broken plates and adhered the fragments with Thinset to walls and pots to decorate our gardens. My last project is this stepping stone. There are thirteen ofrendas in this exhibit. I will talk about four of them, although I found them all very compelling. 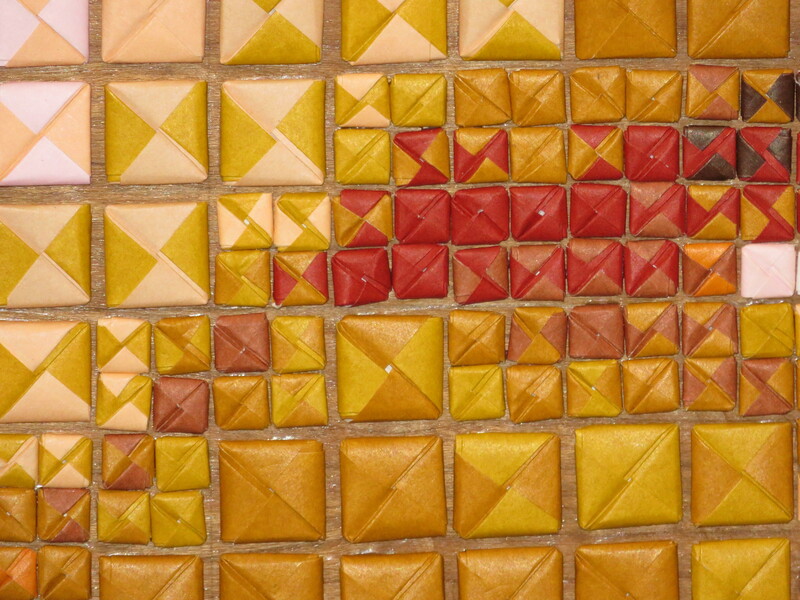 All origami! Soon all of us had figured out that the entire ofrenda was made out of paper except for the wooden platform. 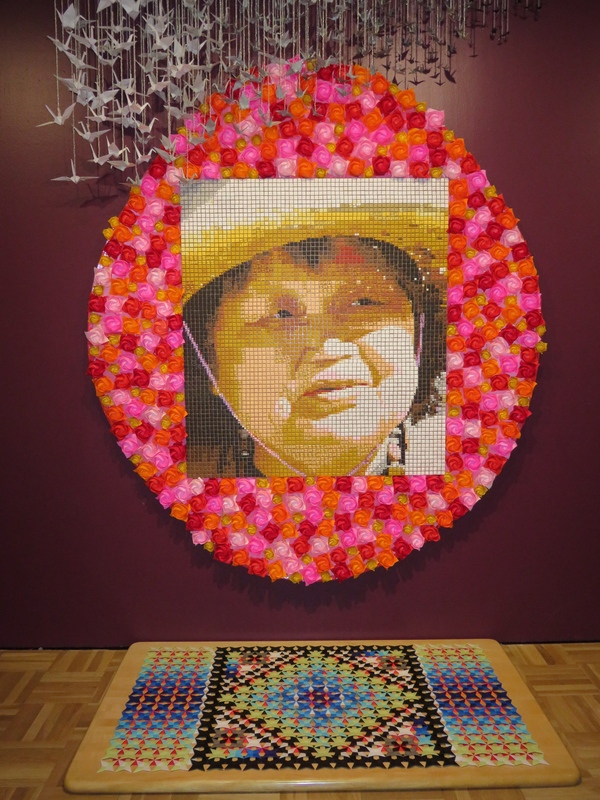 On this ofrenda: A photo or likeness of Ruth, a circle of origami flowers representing the circle of life, with cranes flying away in the sky symbolizing the metamorphosis from life to death. The light is the sun shining on Ruth’s face as well as the tiny specks of light coming through the bent and broken brim of her straw hat. The flowers are in the realm of the earth. The underworld figures are on the platform, where you can see another layer under the blue of the water. No vessel to drink from, but water nonetheless. 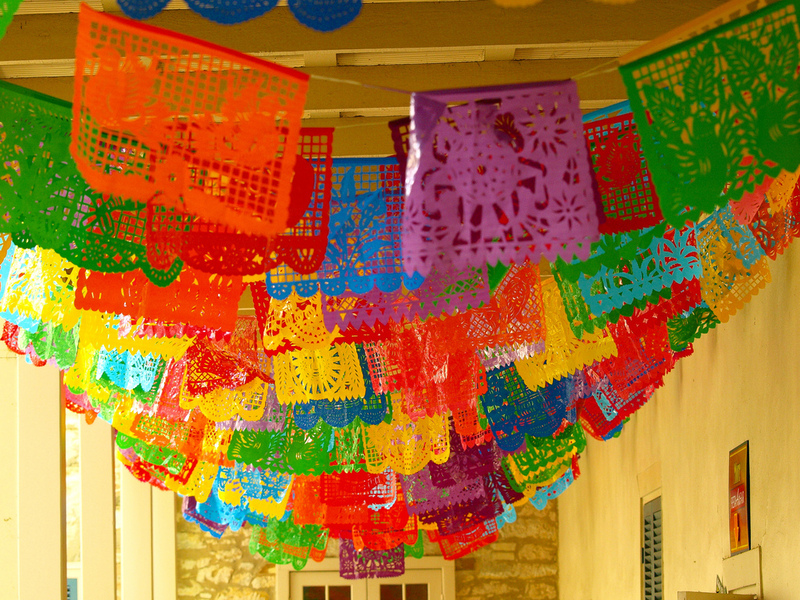 To me the origami covering the platform looks like papel picado, a traditional art form used in celebrations. Another favorite ofrenda is by Nancy Hom. She is a community artist in San Francisco and specializes in mandalas. 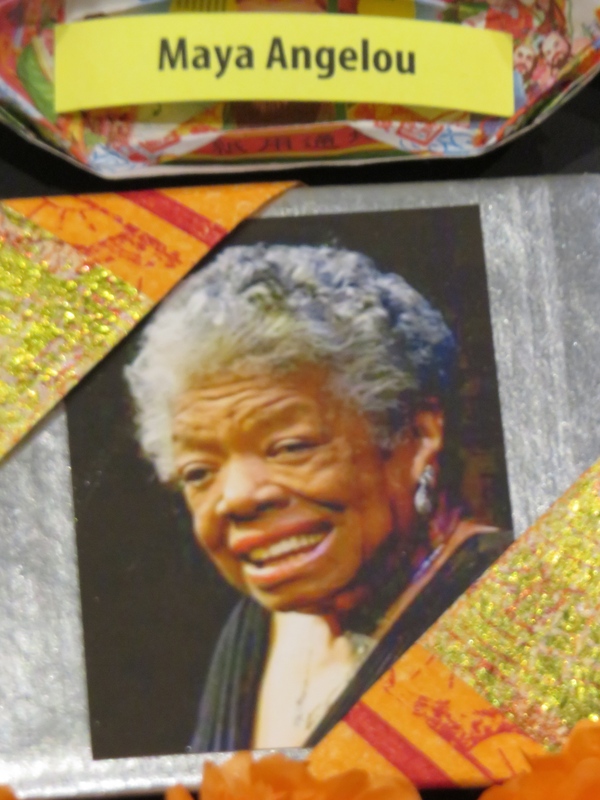 For the exhibit, she created a piece called Circles of Remembrance. Curator Evelyn Orantes explained that she felt that the mandala was the center of the exhibit. She thought of it as what happens when you drop a pebble in a pool of water and everything ripples outward from the splash point. As a community artist, Nancy had many artists help her create the concentric circles. 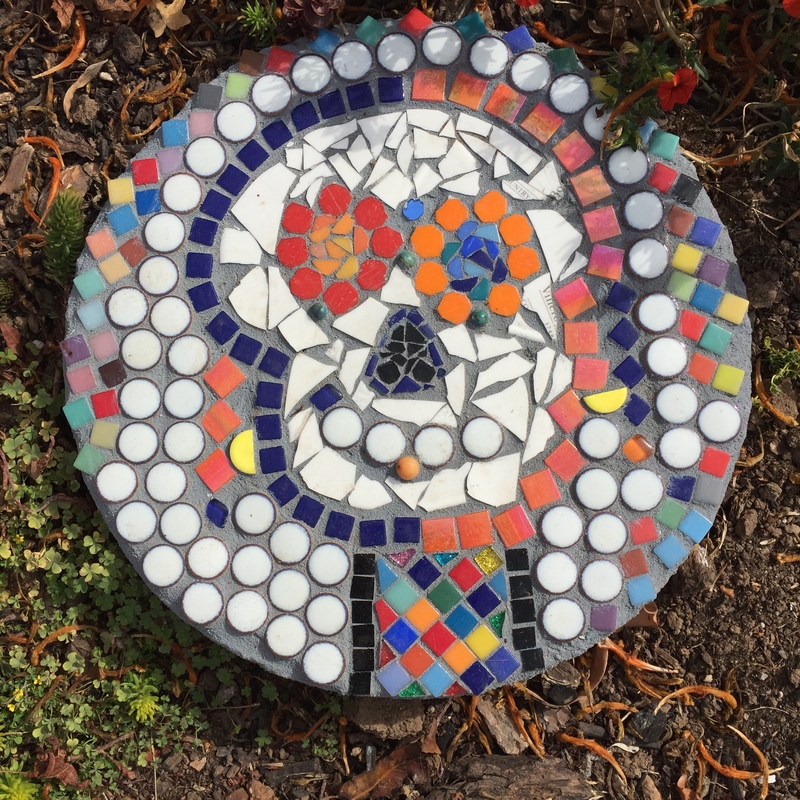 Before we ended our day together, the art teacher and lead artist Kristi Holohan, who organized a student-built ofrenda, arrived.This is The Lit Path by the MetWest High School students. Kristi allowed these middle school students to use a jigsaw to cut their own figures. It is a moving work with many pieces to it. There are photos, but not of the deceased. They are of the artists themselves. The tree is the logo for the City of Oakland. The headphones connect to an audio portion of the exhibit. One of the students’ heritage goes back to the Aztec roots I talked about in the beginning. Another student talks about coming to California and crossing the border. All eight audio portions are intense. Our next meeting begins on the Oak Street plaza where more of us talk about special things from our ancestors. We all have a hard time making our presentations short. We spend the rest of the time in the exhibit hall listening to several experienced docents talk about one of the ofrendas. I am most intrigued by one by Bryan Keith Thomas depicting an African theme. It is named I’ll Fly Away and an art docent walks us through. The skilled docent gives us time to look and do some free association. The fans remind me of a dance performed by the Alvin Ailey Dance Company. It is a church scene where the African women are dressed in yellow dresses and hats with large feather plumes in their hats. It is so hot in church they need fans to keep themselves cool. Upon closer examination of the fans, I realize they are imprinted with the name of a funeral parlor on one side and photos of the deceased on the other. The fans advertise the name of the business and keep the mourners cool. If we look for traditional elements on this altar, it is hard to find them. There are, of course, photos of the deceased, alive and dead, showing the duality of the culture and how life and death are intertwined. There is a tiny African figure in the middle of the second row from the bottom. There is a wooden shape that looks to me like a bellows. There is also a tiny photo of Huey Newton, the political activist who, along with Bobby Seale, co-founded the Black Panther Party. Little sacks stand out on four of the structures. At closer observation you see that they are filled with cotton. One of the members of our group takes a little net bag from her pocket. “I thought that I’d ask the children what they might put in a bag for someone.” Great idea! The cotton in the pouches most likely represents cotton fields that so many African slaves worked in. It was not a good place to work. The feathers may represent the sky, as in birds flying away. An interesting structure in the middle of the top row has nails pounded partially into it and a dried flower. 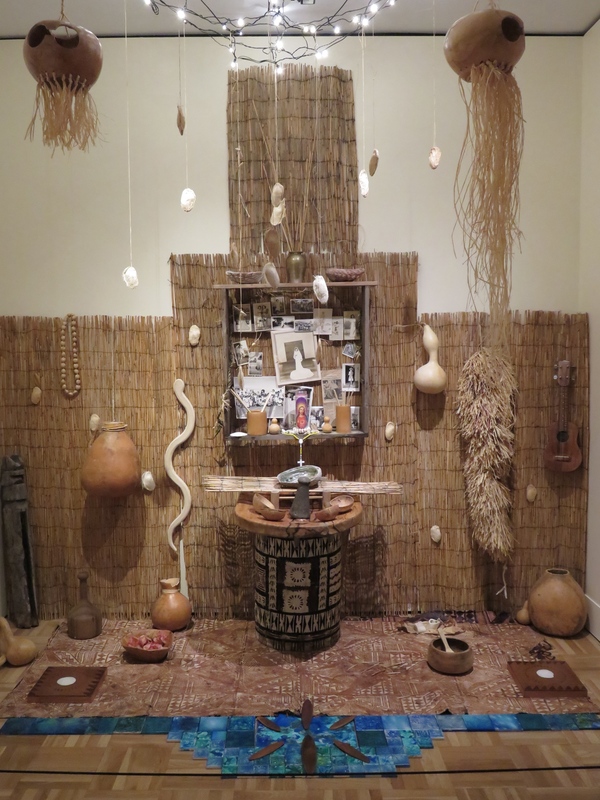 A dark altar for the dark lives that the African slaves had in the south. Later in the week I see the artist of this piece in the gallery. He explains to me that they were separate works which our Curator of Public Practice, Evelyn Orantes, chose from his studio. Evelyn arranged them to create an ofrenda. 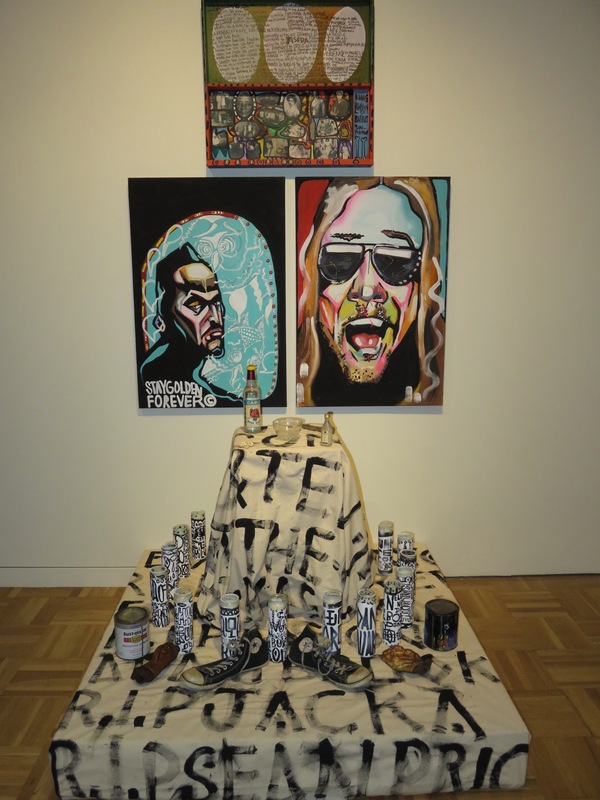 According to Bryan Keith Thomas, his theme is more about immigrants—slavery was not in his mind. “Once I finish a piece and send it out into the world, it no longer is mine. However you connect to it is perfect. You can decide what it means to you.” I told him what his piece said to me. He sees “the mother” taking care of a child. The bags are what an immigrant might carry with him, filled with special trinkets and healing herbs to comfort him on the journey to a new land. While in the middle of the top row I see a cross and nails that tell me of the pain of slavery, he sees the hope of life in the photo of the baby, and the nails as symbolizing wisdom. He tells me this as he rubs the beard on his chin. 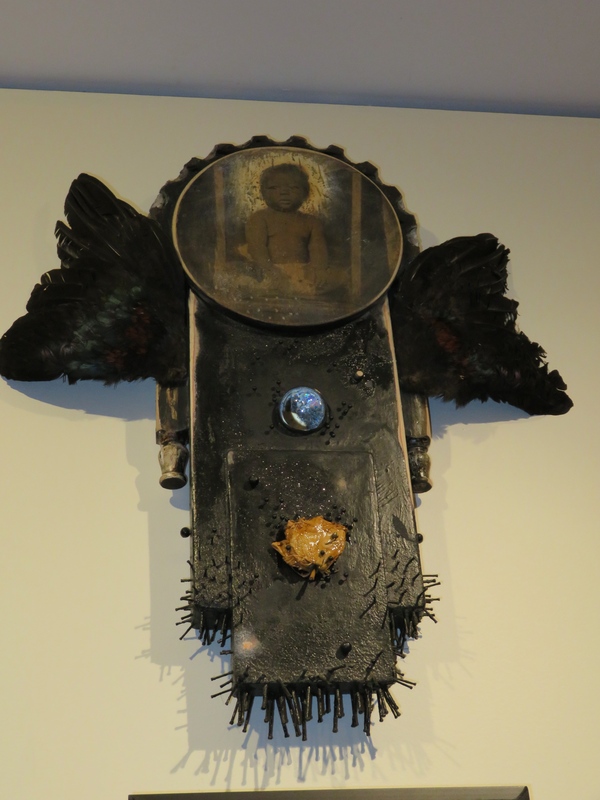 The nails that are protruding from the bottom of this piece are supposed to be prayers. The dried white flower represents “the mother” again. On Mothers’ Day in Africa, you wear a red rose if your mother is living and a white rose if she has passed. Again, Bryan Keith Thomas tells me that once the piece has entered the public domain, he turns it over to others for their interpretation, and he very generously accepts my interpretation. Later that day I thought about talking to him about the different interpretations of his work, and realize that this isn’t that different from the various interpretations of family history. This was the ad for Rolex’ waterproof watch called the Oyster. In 1927 a Rolex Oyster crossed the English Channel, worn by a young English swimmer named Mercedes Gleitze. Of course, none of my cousins were present when their fathers and my father arrived in the United States. We were all born in the United States as the first generation. Everyone has their own interpretation of the stories we listened to growing up. 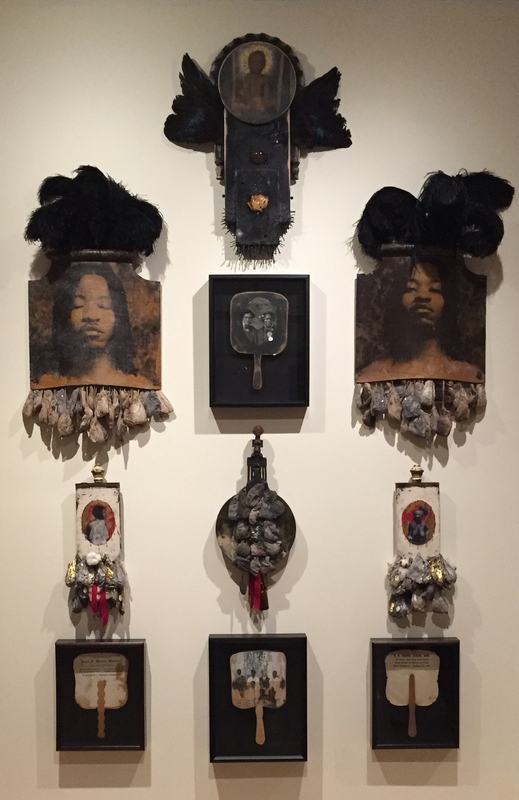 When I examined my family history, I made assumptions in much the same way I did when I studied Bryan Keith Thomas’s mixed-media ofrenda. I don’t know if I convinced my cousins that my interpretations have authenticity too! The more I contemplate Bryan’s altar while I am in the gallery, either touring or wandering on my own, I think that the family history and the ofrenda history are the same; it’s just the presentation that is different. The conversations that rise out of these ofrendas allow the viewers to connect to them and to their own lives and families. The feedback received from my cousins gives me clarity about choices made later in the lives of these men who traveled from Poland to America at the turn of the last century. 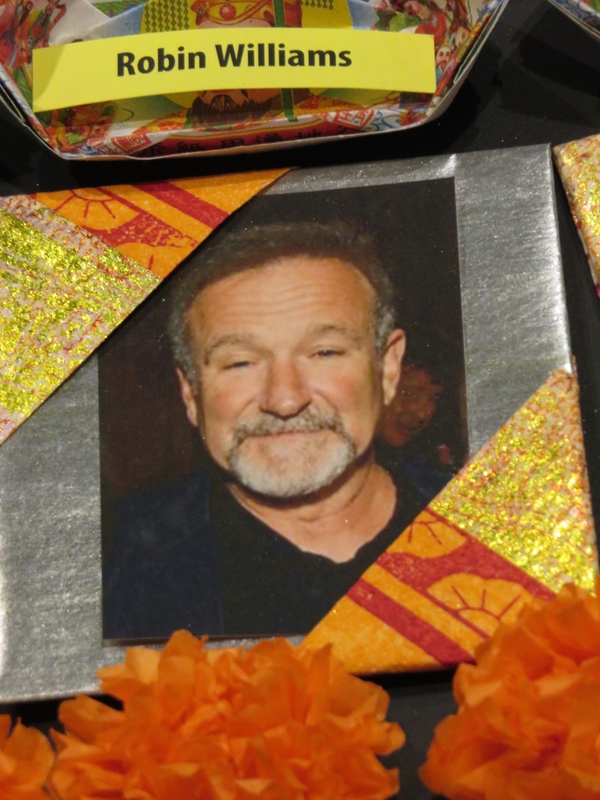 Not only do viewers have different interpretations of the ofrendas, but a family’s ofrenda changes from year to year. New people may earn their place on the altar, and the family may have different ways of arranging the elements on them. 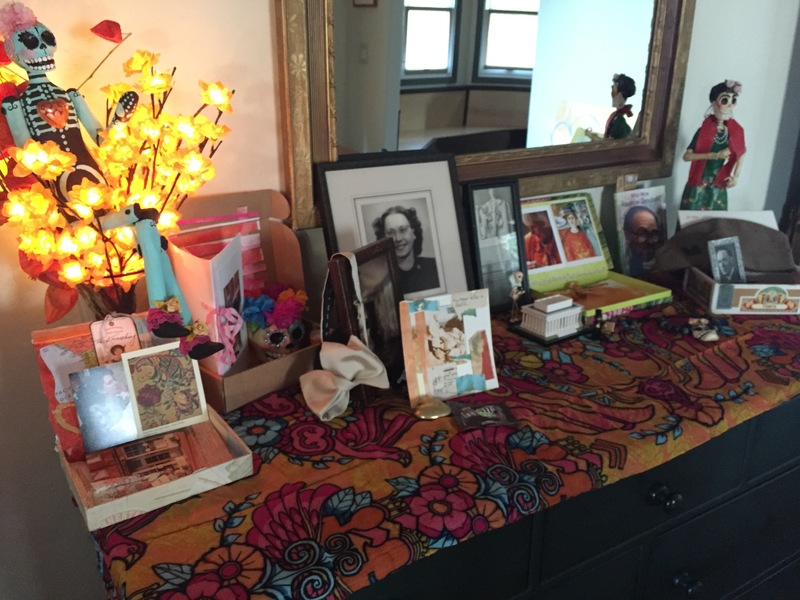 My ofrenda is full of history from my own family and friends. The doll on the right is created by Dania Elisai Arte from Mexico City. Dania and her husband are friends of Rachel-Anne and visit the Bay Area during this time every year. 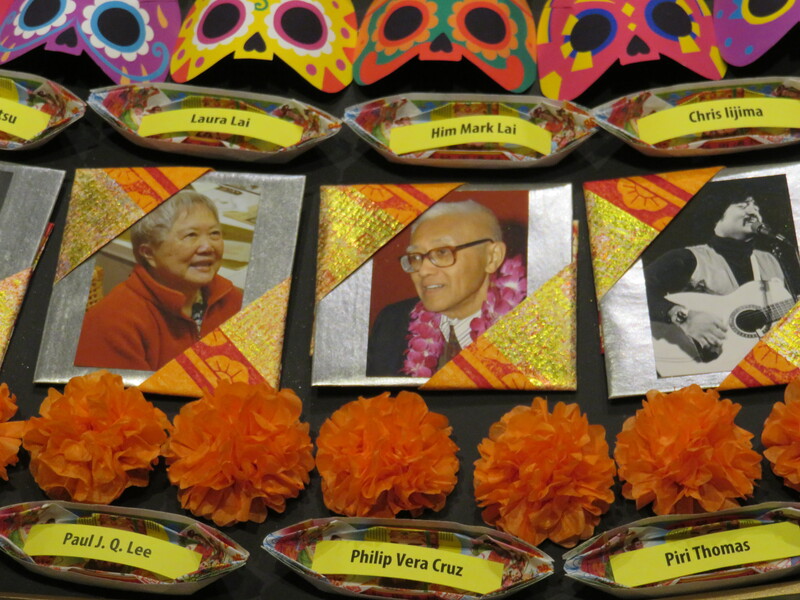 This season of Dias de los Muertos, I had the opportunity to provide a virtual tour for home-bound seniors. I spent several weeks while training in the gallery deciding which ofrendas I wanted to feature in my virtual tour. The staff in the docent office were an amazing support, and together we photographed and culled the best photos. These were sent to the OMCA Design Department to be turned into a digital brochure, which would be emailed to the Senior Center Without Walls. From there, hard copies were mailed to all the participants. What a wonderful opportunity on both sides! 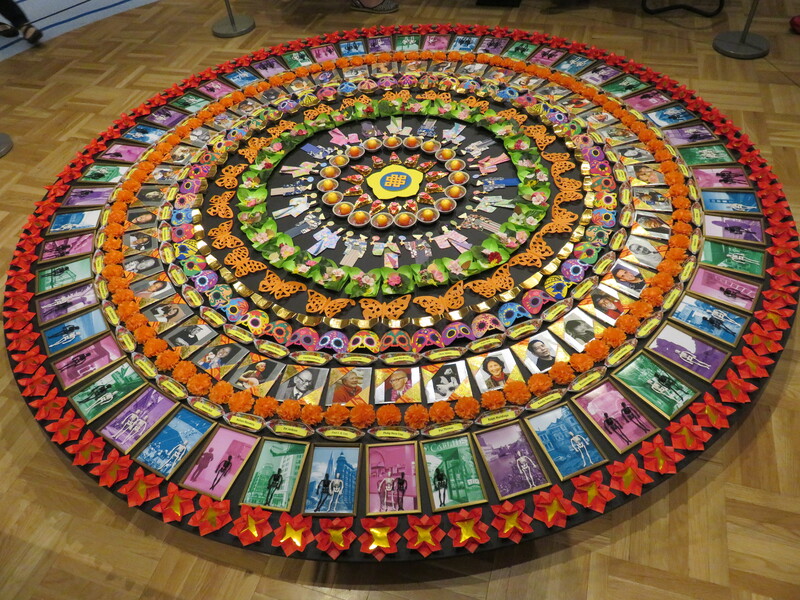 For this virtual tour, I include the origami ofrenda for Ruth Osawa; Circles of Remembrance by Nancy Hom; Border Cross, a gift of the Border Angels to the Oakland Museum; The Lit Path by the MetWest High School students and Lead Artist Kristi Holohan; I’ll Fly Away by Bryan Keith Thomas; Street Offerings by Safety First; and Oracion (Prayer) by Charles Valroso. At 2:59, I dialed in and was met on the line by Amy, who was going to introduce me to the group calling in. 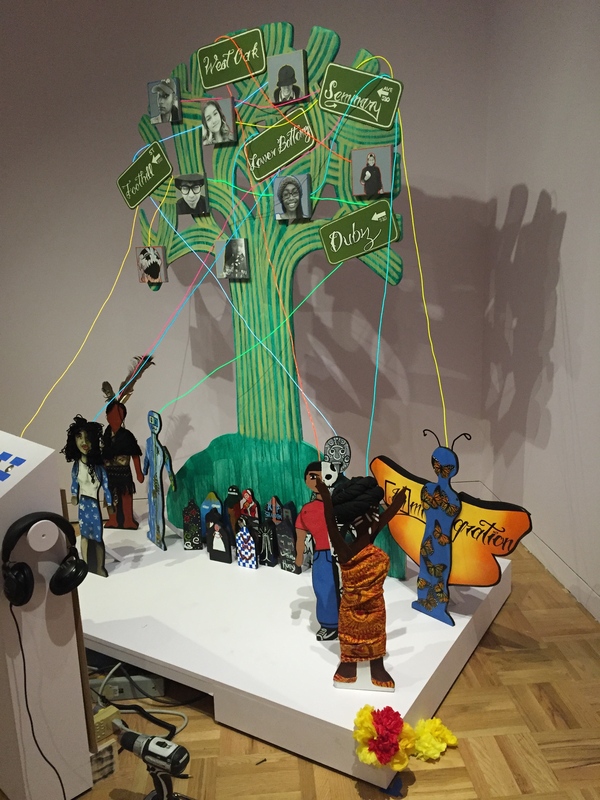 “This is Emily Zell and she is a docent at the Oakland Museum of California…,” she began. I had to stay focused and imagine all my “visitors” in the gallery as I paged through the packet I had prepared for them. The group I was touring, would not see the gallery; the photos would have to be enough. It was up to me to help flush out what could not be seen. The hour passed so quickly as I answered clarifying questions and tried to give the virtual group the opportunity to participate. “What are the skeletons made out of?,” someone asked. At the end of actual tours, I usually have the children stand in front of the skeleton. I described the little footprint that was out of the photo’s range that offered correct placement in case you wanted to take a selfie. Everyone laughed when I told them about this! Did you do this at the beginning? Some of the participants were unfamiliar with the holiday altogether. This was my favorite part of the conversation because I was able to deliver a bit of historical content, and the group had lots to say. “So many people who came over from other parts of the world left their cultural celebrations behind. It is so nice that the Museum does such a great job of helping the community hold on to these traditions!” one of the group commented. Several others chimed in, and soon the connection of finding yourself in our museum began to blossom. Even though these attendees were not in the museum physically, they were here just as much as those I toured early that morning. When I told them that this temporary exhibit would last until January 3rd, I could hear a collective enthusiasm build. I imagine that some of them will try to visit the gallery in the next weeks. I love to talk and there was so much more to share, but it was quickly 4:00. Amy said I could add on more time in 15 minute increments. I took her up on it, and we all chatted happily until 4:30. It was much more fun than I anticipated. My visitors had lots of questions, and brought in personal memories, just the way I hope visitors to the actual museum do. In fact, I hope that some of the men and women on this virtual tour are able to come to OMCA and see the exhibits for themselves! The school and adult tours continued though the month of November and will end on January 3rd, 2016. Rachel-Anne Palacios was pretty amazing as our Lead Educator. She trained, scheduled, supported and met us before every tour with this incredible smile over the weeks we toured. Sometimes our school groups were much larger than anticipated or the children super excited, or the classes got off to a late start and we had to cover a lot of material in a short amount of time and we got stressed. 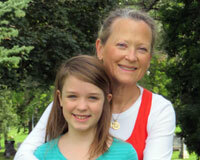 Rachel-Anne was always calm, stayed nearby when we were nervous with a large group and needed a little encouragement. Her smile could just make everything smooth out! 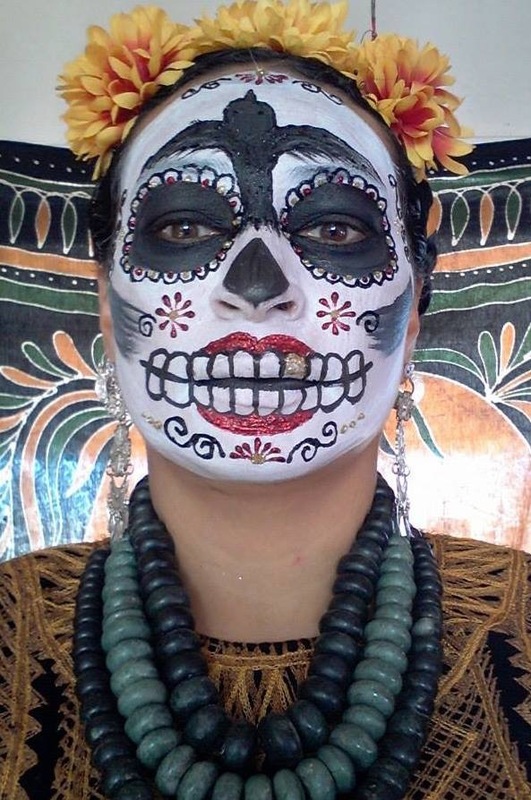 She also wore the best clothes that were so cheerful and on the actual Days of the Dead, came in full face make-up! 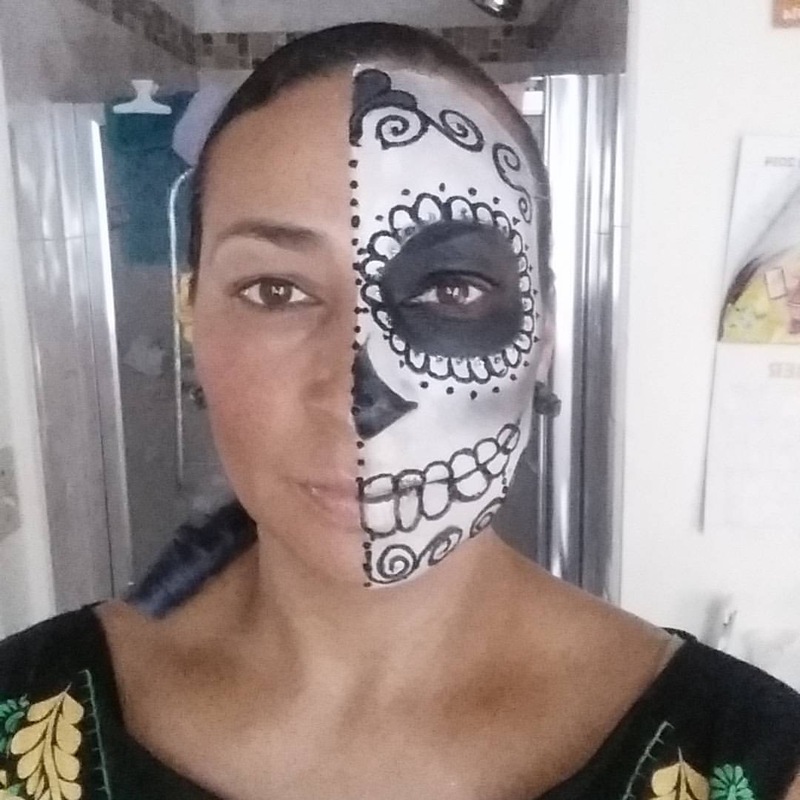 Next year I am having Rachel-Anne paint my face! I even got a certificate!! can feel the joy you have in doing this wonderful work!! Thank you, Louise. I love what I get to be involved in at OMCA. The people, the art, the exhibits, the energy and all supporting and sustaining Oakland! All good things. So glad that you are part of the team. this was aweome emily! i am so sorry it took so long for me to check out your blog. i absolutely love working with you and sharing art, shoe and life stories. lets continue to grow our connection!!! love you my beautiful friend!! !